Lug Caps are widely used in Food Industries to seal the glass jars. Looking at the demand in the market to enclosure the lug caps (twist off caps), Kahan International have developed automatic Lug Capping machine which is operated pneumatically. These machines are similar to other capping machine but the twisting of the caps in these machines will be bit critical. Lug caps are to be sealed for a particular degree of rotation to obtain a perfect vacuum seal. If the angular twisting of the caps is more or less than the requirement, would result not into perfect sealing/capping. So we very precise in providing a perfect leak proof sealing of caps in our lug capping machine. It depends on a lot on the nature of the tightness of the lug cap with the glass jars. 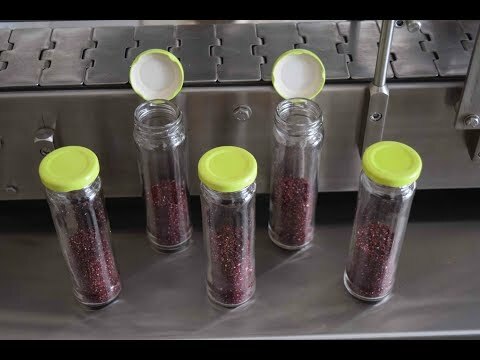 The quality of the jar, as well as cap, impacts a lot with the result of sealing with our machines. We have a single head, as well as multi head models giving an output from 25 BPM up to 120 BPM speed. The machine is designed and constructed by qualified engineers with good quality material and components which give best quality output and least breakdowns. Easy change over parts from change of one size of bottle to another. Motor positioning system provided such that when the jar picks up the cap this positioning station will take all caps to its start of thread. Italian Pneumax make pneumatics used for capping purpose. There are 2 movements of the capping head provided. One will take the head down to hold the jar and another to rotate the cap as per the stroke. Below jar there will be Hemri wheel provided such that there is no slippage of the jar. Machine will stop of any bottle in operation will get stuck due to any issue. 1 Hp to 2.5 HP, 415 V ± 5 V Three phase depending upon the models. 2 HP motor compressor, 7 kgf/cm2 pressure, 6 cfm flow rate of volume. I would like to enquire about KI-ALC Automatic Lug Capping Machine .